Spring sunlight gradually warms the meadows, until they bloom with a sudden profusion of wildflowers. 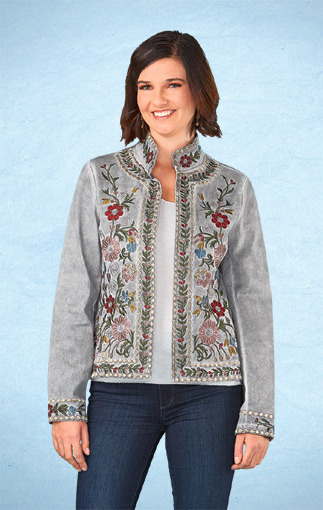 This lightweight jacket evokes an alpine meadow with opulent floral embroidery, highlighted with silvery swirls and framed with golden trim. Oil-dyed fabric has a lovely textured appearance, which will vary slightly. Features stand-up collar and open front. Cotton/elastane; hand wash. Sizes S-XL.